Collection of select articles in the field of developmental education. 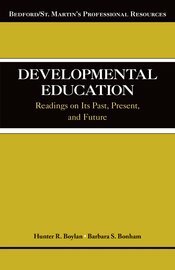 Developmental Education: Readings on Its Past, Present, and Future offers twenty-two selections on historical efforts to serve underprepared students, on the state of developmental education today, and on innovative practices and possible directions for the future. Compiled by Hunter R. Boylan, Director of the National Center for Developmental Education (NCDE) and a professor of Higher Education at Appalachian State University, and Barbara S. Bonham, a professor in the Department of Leadership and Educational Studies at Appalachian State University, each chapter also includes introductions and questions for discussion and reflection.